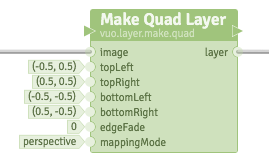 The Make Quad Layer node takes an image as input, and maps the image to fill the specified quadrilateral. It can optionally fade the edges to alpha-transparent (the edgeFade port specifies the fade distance). By default it applies perspective-correct mapping, which can be toggled to affine mapping (e.g., basic 4-point quad warping). iason: I'm having trouble understanding your suggestion about toggling between perspective and orthographic projection. How would orthographic projection be useful (or even technically possible) in the context of applying projection distortions to a quad? Could you provide an example? the "correct" one was done with the GLSL Shader mentioned in my first comment. Thanks, iason. To me, your "correct" image looks like perspective-correct mapping, and your "false" image looks like affine mapping. I'm thinking that in Vuo's mapping node, we'd just provide perspective-correct mapping. Is there a reason you'd ever want to use projection that looks like your "false" image? i think one of the advantages of affine mapping is, that it keeps lines in parallel. that can be useful for certain projection mappings. i havent used the affine mapping in a while, so im not sure about the visual differences. but thats the reason why i wished for that feature in the first place. so i can just flip a switch and see the difference. A great addition to this node would be a crop on the input texture. Top, bottom, left and right crop. Take a look at the mapping features of other apps to get a feel for the tools that are used for mapping. This is a great start, the next logical step would be a grid warp patch with bezier options. In vvvv we have a source points input and an output points input, so you can warp from the corner points, but by setting the source points inside the image you can specify a point that isn't the corner of the quad, but is the corner of part of an image/realworld geometry, i.e. for mapping things that aren't rectangles, maybe a building with turrets or similar. We also can do a 4 point 3d homography by specifying these input points, mapped to the output points, and multiplying by a perspective transform, you can map a 3d object rather than just a plane, which requires the object to be exact, but can be fudged for real world applications. "4 point 3d homography by specifying input points, mapped to the output points, multiplying by a perspective transform to map a 3d object"
" setting the source points inside"
"grid warp patch with bezier options"
this is another feature request as well i guess. data inputs for grids and bezier curves are very large. take a look at the 1024 qc bezier wrap patch. it has 20+ inputs for all the points and curves. still two very nice features to have in VUO. Excellent work here everyone! Let's begin by getting proposed Make Quad Layer node fully pledged. Then, once it's implemented, we can create and refine feature requests for the complimentary functionality. I'm excited to see this happen. Is there any workaround until this node would be include in Vuo? I should use it for translating an QC composition in Vuo for a live show using _1024_Perspective Patch which do almost the same. Vuo 1.0 is here — check out the free trial! Vuo 0.8 is here! — Get creative in 3D! How to get point mode with a node?